The Kamele ngoni (young persons harp) is a harp-oud from the Mandingue region of West Africa (especially Mali and Burkina Faso). This instrument originates from the 6 string donso (hunter) ngoni which is instrumental to hunter ceremonies, accompanying the singers praises of great hunters and taunts to other hunters to prove their hunting prowess. The donso is normally accompanied by a karagnan, a metal scraper that produces a repetitive element to the often heady and hypnotic hunter melodies. A great example is Malian donso Sibiri Samake. The kamele ngoni (Kamale ngoni/kamelengoni) was created sometime in the 1960’s by Wasulu Musician Allata Brulaye and was first recorded in 1983. There was a powerful social reason for the creation of the kamele ngoni and indeed its meaning ‘young persons harp’. Mande countries of West Africa had stratified societies with artisanal classes. Traditionally you would have to be born in to a Griot family to play the Kora. 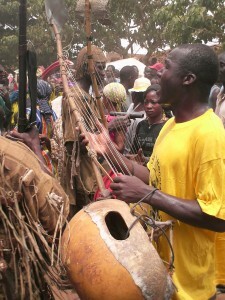 Whilst the Donso were not Griot, you did have to undergo an initiation and the music was quite a serious affair. In the Wasulu region, people believe that all people are entitled to make music (except donsongoni harp), so whilst the kamele ngoni is very structurally similar to the donso ngoni, its creation allowed people to step outside the rules and revolutionised Malian music. Its creation was indicative of social change like much of the world in the 1960’s. It was the music of all night dance parties, and it was said to have been fiercly objected to by the elder generation. The Kamele ngoni today is an instrument of growing popularity in West Africa and around the World that allows players to be involved in this music outside the strict hunter societies of Donso music or the hereditary Griot lineages which accompany instruments such as the Kora. It has been popularised significantly in the Wassoulou region of Mali through artists such as Oumou Sangare and is a staple in the music of Salif Keita. Afro-Eire teach and perform Kamele ngoni music from Mali and Burkina Faso. The music is learnt by Paul McElhatton on field research in Bamako (Mali) and Bobo Dioulasso (Burkina Faso) with Ibrahama Sanou in 2006 and Griot Drissa Diarra 2008, and in workshops in Ireland with long time student of Kamele ngoni Jean Marc Collin.